This is a Skill Slayer achievement. 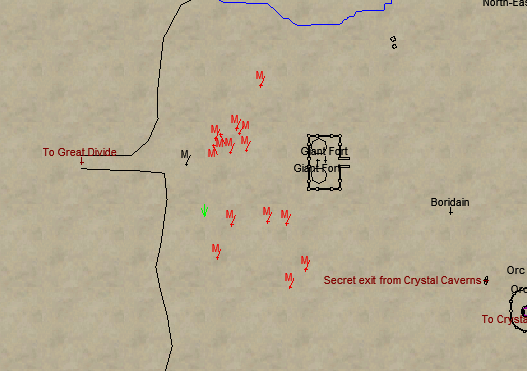 I zoned in from GD to see 3 manticores between the zoneline and the giant fort. So I stayed in that area and killed everything that moved. Kill giants, coldain, dervishes, 2-legged, 4-legged, bunny's, etc. I got about 20 an hour doing this. The total area covered extended to the southwest of the giant fort but I did not stray far from the zoneline/fort. I added an M to my map everytime I killed one, some were at spawn points, some were moving. I just wanted an overall look at where they were showing up. Just to confirm, the map above was in the old Eastern Wastes, not the level 100 ZK Awakening. So the minimum level above should be around 40, not 100. Do the mob-count version. You'll need to kill anywhere from 50-60 mobs. Each run you can expect to get 4 or 5 manticores. If you're level 80+ it should only take 10-15 minutes per run cycle. Other mobs you get there will fill out your goblin, goo, bears, holgresh achievements. I should add that the manticores seem to only spawn in the Everfrost LDoNs that are like libraries. If it's a cave or the inside of a building with frozen walls, they don't seem to spawn in those. If that's the case, just kill enough to complete the mission and try again. If it is the library model, you can keep killing everything in the zone even after you've completed the mission. In the libraries, the rooms that are setup like a little maze pretty much always have a manticore. They still spawn elsewhere, but make sure not to leave any of those rooms (look at your map) unvisited. Manticores are rare! This was the lasy Slyer "Skill" category I got done! I got it done in the Everfrost LDoN adventures. I seemed to have better luck with the ones that you entered by way of the icy cave. Even so, the manticores only show up maybe 4 to 8 per dungeon, and only in the dungeons that are NOT frozen zones. So, if you get a frozen zone, just get the adventure done and don't waste time clearing the entire zone lookign for manticores. Win it and try again.